As ever, the main thoroughfares in the pedestrianised areas were strewn with the usual collection of kebab fast food establishments. We walked up and down one street without finding anywhere that grabbed our attentions. Eventually, though, I spotted a place that looked slightly more up-market. It had tables outside that were immaculately made up, decorative fountains, smartly dressed waiters but no menu. I ventured closer to see if there was a menu at the entrance, but still no sign. While I investigated, the head waiter smooched over and encouraged us to follow us upstairs where, I could only assume, a menu would be forthcoming. We were led over to a corner table, as I asked to see a menu and was reassured in words that I didn't understand that something was forthcoming at least. Duly seated, we were fawned over by two waiters and a head waiter who were showing us entree dishes, bread rolls and asking what we wanted to drink, almost at the same time. Once we had drinks and a starter or two, we took a look at the menus that had materialised at last. I had contemplated bringing along the phrase book - that is the completely useless phrase book that came from a bargain book shop and in which we could never find the actual phrase required. But that's beside the point, Anything would have been useful at this stage. The menu was in Turkish and there was no English alternative. On top of that, the waiters spoke little English, the head waiter spoke some English but confusingly. For example, we would ask about fish, he would say something that sounded like "No fish" then reappear minutes later with a platter of fish. All very confusing. Our dining experiences prior to Ankara had evidently put us into a safe little tourist bubble where phrase books were nothing more than a distraction in the way of an otherwise perfectly straightforward tourist-hawker/shopkeeper/restaurateur transaction. Somehow, I managed to recognise one of the Turkish names for fish - the lüfer, or bluefish (which I had on our first group meal back in Istanbul). With a bit of pointing at the fish platter and general good luck, we both had an excellent meal. And how's this for service - after the main course, one of our attentive waiters moved in to clear the plates then produced a mini hoover - a dust-buster - to clear any breadcrumbs off the table cloth before desert was delivered (a heavily laden plate of fruit). There was just one thing left - a bill needed paying. And just how much would this three waiters to a table and dust-buster service cost? Despite this being the poshest dining experience yet, it came to the equivalent of just £14 for both of us. 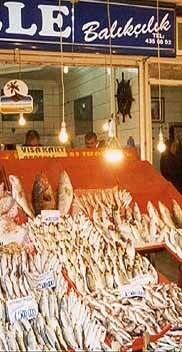 A fish stall in Ankara.